How do you Mālama Honua? Keiki imaginations run wild during Capt. Steve Soltysik’s maritime classes. The creative educator’s lessons entail navigating a worldwide voyage and hands-on activities, such as catching rubber fish with clothespins and “cooking” them in the galley. Keiki receive valuable training, like how to work as a cohesive crew — with the added bonus of having fun. “They go crazy — good crazy,” says Soltysik. 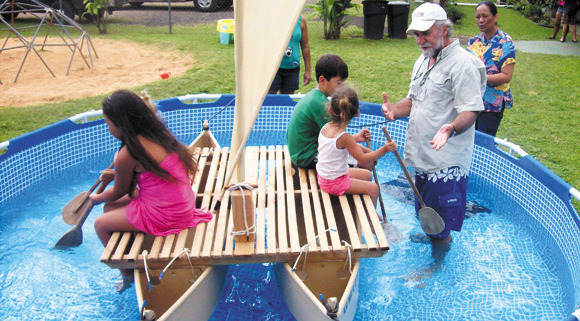 Elementary school students across the island who are lucky enough to be enrolled in one of Soltysik’s classes have opportunities such as hopping on much-smaller versions of Hokule’a and Hikianalia, which they assemble as a team and learn to steer in a kiddie pool. During these lessons, students are assigned different crew member tasks while, at the same time, learning elements related to operating a canoe, including weight distribution, paddling and water safety. “Maritime education is really where my heart’s at,” says the waterman. Soltysik currently is serving his second-year fellowship with Bishop Museum and A’o Hawaii, and is working to develop even more memorable and engaging classes, including a star compass navigation course that introduces keiki to foreign languages. The lesson involves a large, homemade Hawaiian star compass map (an idea conceived by Hokule’a navigator Nainoa Thompson) with which keiki learn about directions. Soltysik’s added twist of understanding how to say north, south, east and west in other languages makes it even more unique. Each child holds a compass to determine their accuracy, and also learns about the positive and negative attributes of compasses and modern-day devices such as GPS. 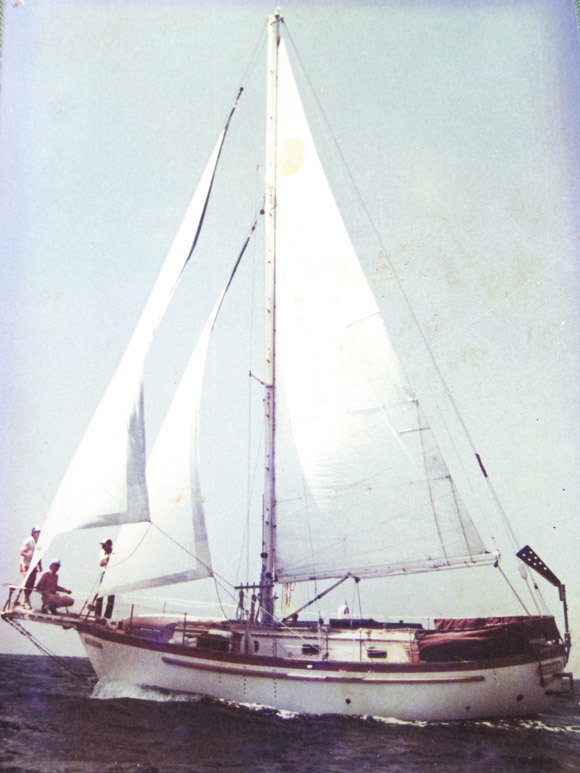 The boat Soltysik built and sailed from California to Hawaii 28 years ago. “I get them active; get them out of their chairs,” says Soltysik, who has a California lifetime teaching credential and was an agricultural engineering major at Fresno State University. 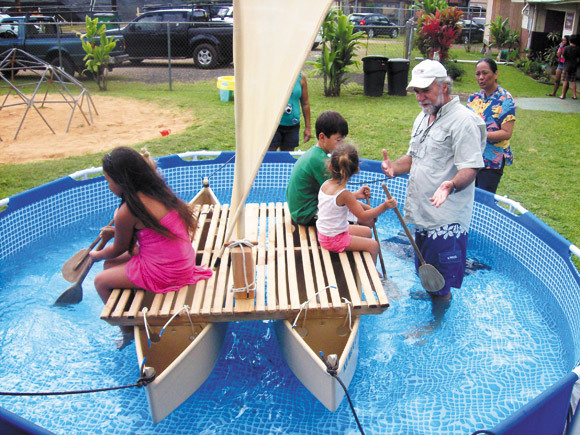 His inspirational lessons also include miniature canoes keiki work together to build, like a three-dimensional puzzle. “Some of the kids are so accustomed to iPhones, computers and video games, many kids don’t even know where to begin with them,” he says. 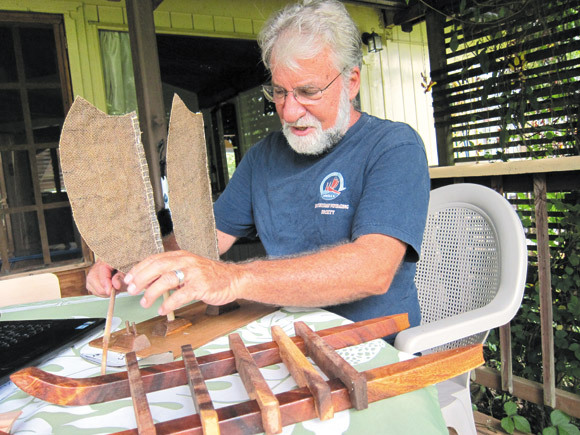 The scrap-wood canoe models are precut by Kauai Community Correctional Center inmates, who have made more than 30 for his classes thus far, and Soltysik is hoping to build even more. “I couldn’t do this without their help,” he admits. Soltysik always has wanted to teach maritime education, and he began with an after-school program about boating and nautical careers at Kauai High School until Hurricane Iniki hit in 1992. And although he has credentials in secondary education, Soltysik gravitated toward younger students several years later after being asked to collaborate on educational projects with fellow Hawaiian studies kumu Sabra Kauka. “He is truly an amazing teacher and human being,” says Kauka of Soltysik. She is especially proud of their combined efforts to bring the lessons of Hokule’a and Hikianalia to every fourth-grade class on the island. 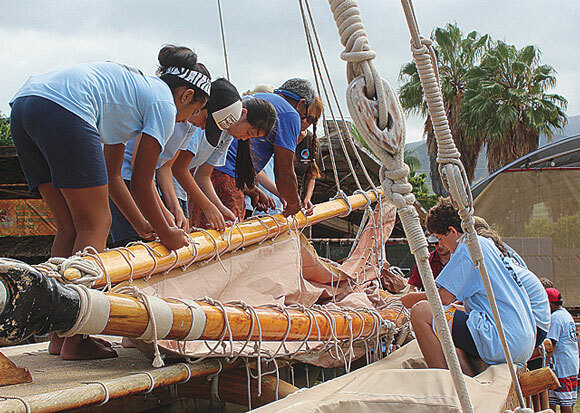 It helps that Soltysik actually was part of the crew on the Hokule’a for three interisland voyages in the 1990s and aboard the Hawaiiloa in 1997, as well as Hikianalia for an interisland trip in 2013. “As many of my elders have said, ‘When you swallow the hook, and you really connect with the canoes’ — it alters your life in a very, very positive way,” he says. Although the family, which grew to include adopted daughter Jade, has lived on dry land in a home he built in Puhi 28 years ago, the ocean has never stopped calling Soltysik. “His heart is in ‘catching the young ones upstream,’” says Kauka.